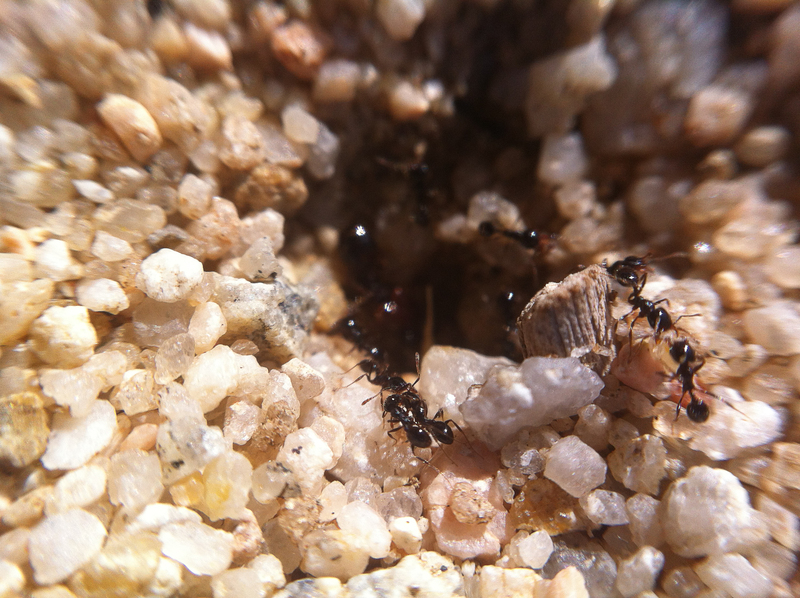 Ants come out in force after a rain event in Joshua Tree, new hills popping up everywhere. I suspect that this is for the same reason that we humans here break out our shovels after rain: the digging is easy. We call these “big purple ants,” about 5/16″ long. They are not too common, and it’s a good thing because their bite hurts the worst of any ant in the area, throbbing for an hour or more. We call these “big red ants” or “big red and black ants” if we’ve got a lot of time on our hands. They are a little smaller than big purple ants, and their bite hurts a little bit less. You still want to avoid them. They are the most common ant around, these days, though it seems like that’s a change from when I was a kid, when black ants dominated. We call these “black ants.” They don’t bite, or if they do, you can’t feel it, so we think of them as the good guys. 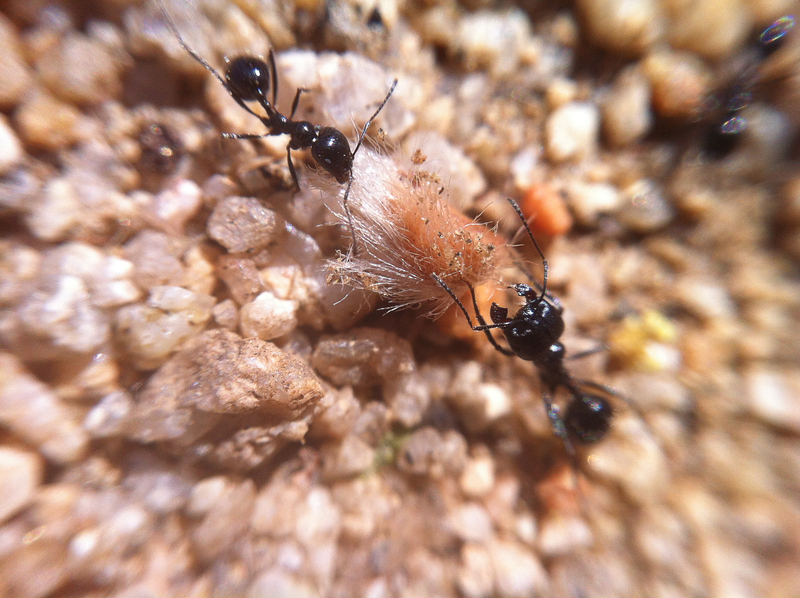 They are significantly smaller than big red ants, here seen moving a creosote seed. 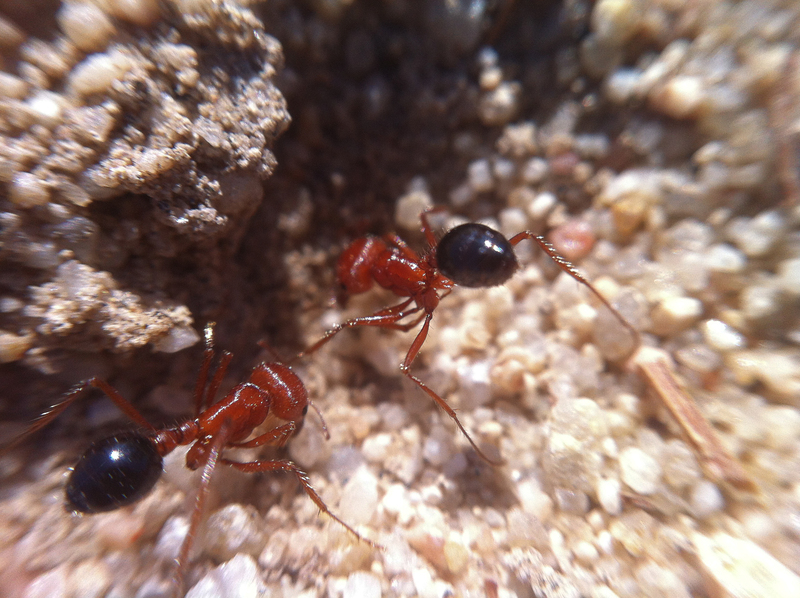 We call these “little red ants.” They are significantly smaller than black ants and are very fast. I had a hard time getting a photo. They are prolific biters and their bites itch pretty bad. And they tend to swarm you. I once had to play a drumming gig barefoot with super itchy feet after getting swarmed while I was loading my kit. Head shot of a little red ant, peering over a tiny fragment of a stick. 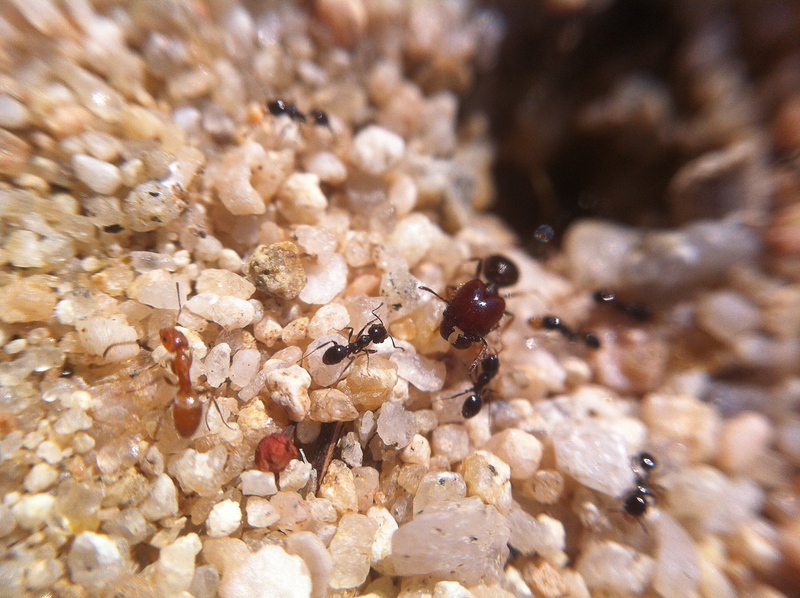 These ants are unusual to see, so we don’t really have a name for them, but they are tiny, significantly smaller than little red ants, so let’s call them “tiny black ants.” They move really slowly. I don’t know if they bite. 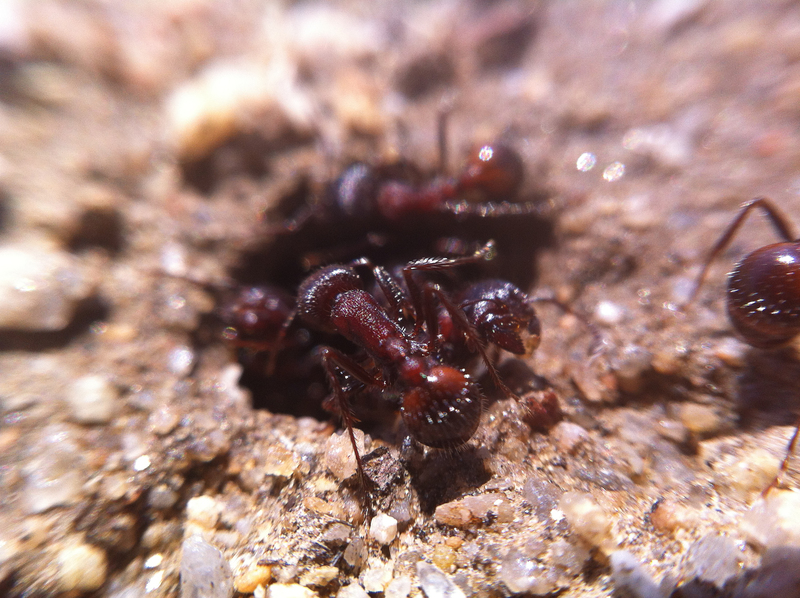 Tiny black ants seem to live with these giant-headed ants. They were crawling in and out of the same hill. Also, the honey-colored ant in the picture was just wandering by. You very rarely see them. This was the only one I saw all day, and I looked all over the property. They get into the trailer sometimes at night, so maybe they’re nocturnal. 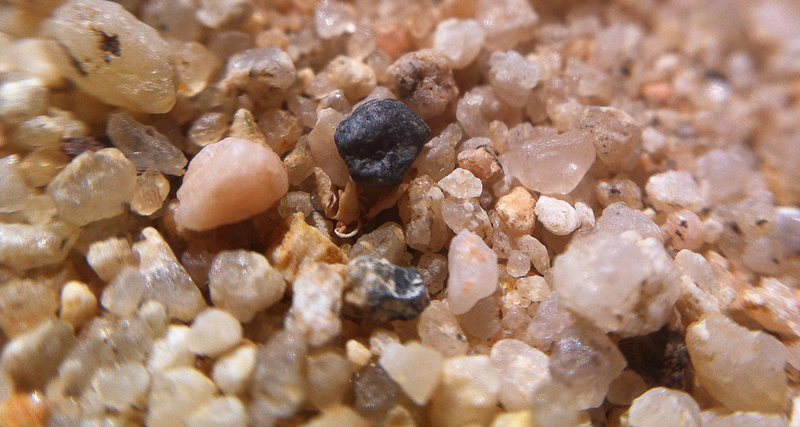 That’s all the ants, but dang, isn’t our sand photogenic? 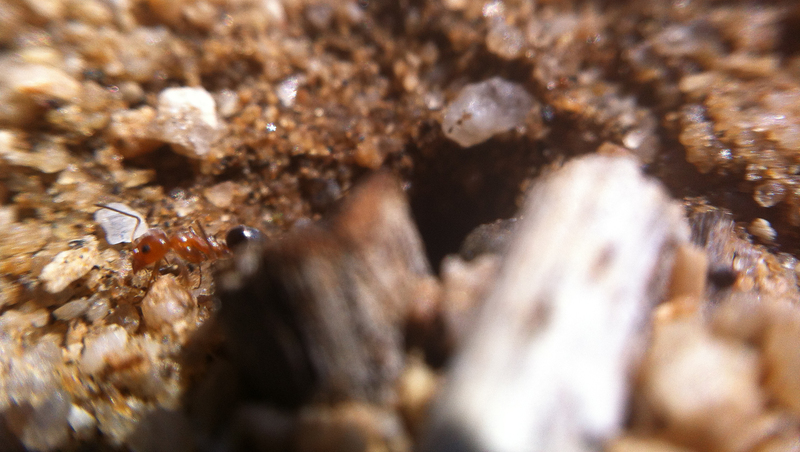 I got a lot of shots like this, trying to photograph little red ants without getting bitten.